Latest Digital Info Blog: Ra.One or Kolkata Knight Riders in CLT20 2011for Shah Rukh Khan? Or Both? Ra.One or Kolkata Knight Riders in CLT20 2011for Shah Rukh Khan? Or Both? 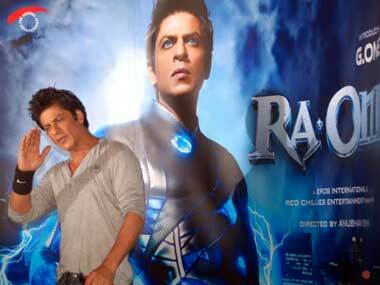 Those currently following the India England ODI series would have noticed the promos for Shah Rukh Khan’s upcoming Bollywood flick, Ra.One, airing simultaneously with the Champions League Twenty20 2011 ads. So, does Shah Rukh Khan have one foot in the KKR dressing room and the other in the box office? Bollywood actor and co-owner of the Kolkata Knight Riders in the IPL, Shah Rukh Khan’s face is stamped all over the sports broadcasting channel with the ads in between the India England ODI series featuring back to back ads announcing the forthcoming attractions in the form of the Champions League Twenty20 2011 and simultaneously SRK’s new movie, Ra.One, with the song from the movie “Chamak Challo” (the same song that was sung by Akon and the video of the Chamak Challo feature was leaked with Shah Rukh Khan, tennis legend, Boris Becker and Akon dancing together on stage ) featuring rather prominently with lead actress Kareena Kapoor in the midst. If one was wondering about the connection, one would have to attribute it to a marketing genius. For one, Shah Rukh happens to the brand ambassador for the Champions League Twenty20 2011 and the link up with his movie seems a rather obvious win-win situation. On the one hand, Shah Rukh Khan’s popularity as a Bollywood actor is expected to draw attention to the Twenty20 tournament that is the spin off of the IPL although a lot less successful simply because cricket audiences have not been too familiar with domestic Twenty20 champions from other cricket nations. Shah Rukh Khan’s added incentive in the tournament is the fact that his team, the Kolkata Knight Riders led by Gautam Gambhir although it is unclear if Gambhir will play at this point – have an outside chance of making it to the main draw of the Champions League Twenty20 2011 if they get through the Champions League Twenty20 2011 qualifier tournament first. It is not a hidden fact that Shah Rukh Khan has been a master puller when it comes to endorsements and profits for the Kolkata Knight Riders even though the IPL team struggled to get off the bottom in the first three seasons before undergoing a complete team revamp with the IPL 4 auctions and thereafter in the IPL 4 season with the likes of South Africa’s Jacques Kallis firing on all cylinders. With Kallis amongst the players who have all opted to play for their IPL franchisees instead of their home team, it should stand the KKR team in good stead. Shah Rukh Khan will certainly be hoping there will be more cheering to do, or rather a mega bonanza going for him by creating the hype prior to the tournament and the release of his movie, whose promos were running even during the ICC Cricket World Cup 2011. Whether both turn out to be extensive hype like a case of much ado about nothing or will both yield Shah Rukh Khan the end to the 2011 season that he could have only dreamt of remains to be seen. For the moment, the channel continues to put Shah Rukh Khan rolling after every over hoping repetition will ingrain Champions League Twenty20 2011 in the minds of the cricket loving public while Shah Rukh Khan is hoping for a double to work in the tournament’s favour while also, working in the favour of his movie promotion. Double whammy or double dose? That’s for the spectators to decide. Hello јust wanted tо gіve you a quicκ heads up. to be running off thе ѕсreen in Inteгnet explorer.